You can't go wrong with this combination! 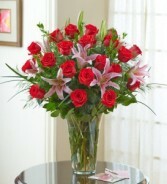 Beautiful Roses and Lilies vase arrangement, Premium Chocolates, Large Bear and Balloons. 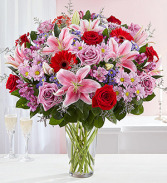 Two dozen premium roses arranged beautifully with stunning stargazer lilies. 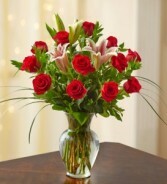 This arrangement is the star of the show every time.